Animal life requires a steady supply of water to fulfill its vital functions. From transportation to lubrication to temperature regulation, water keeps animal life functioning; in fact, the bodies of animals consist mostly of water. All chemical reactions in the bodies of animals use water as a medium. Animals' body temperature should remain in a narrow, specific range. Water acts as a buffer against overheating due to water's high specific heat. Specific heat determines how much heat an object can absorb without increasing its own temperature. Water has a high specific heat because its hydrogen-oxygen bonds dissolve only when exposed to intense heat. Heated water seeps out through pores in the form of sweat and must be replenished to avoid dehydration. The acidity or basicity of compounds in the body, or pH, determines whether acids or alkalines take prominence. Acids and bases have an electrical charge and therefore seek the opposite material to form a chemical bond and neutralize their net charge. For example, bone matter consists of calcium and at least 18 other critical compounds. In the absence of alkalines, excess acid will draw minerals from these sources. 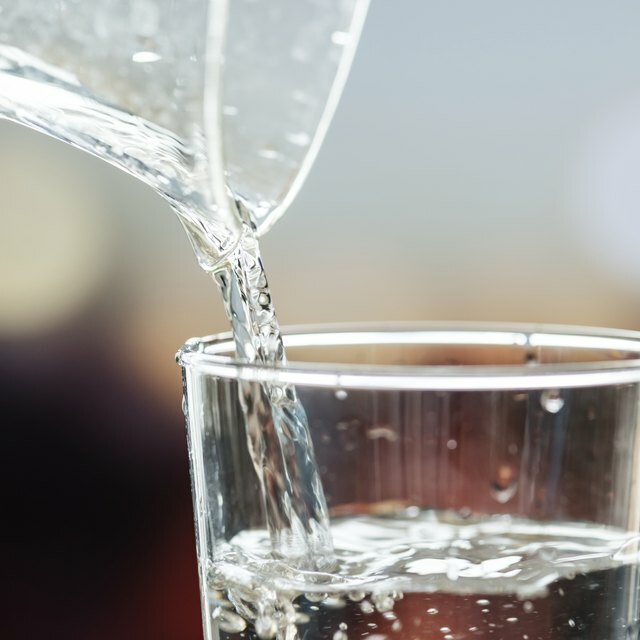 Water, when introduced into an animal's system, will bring its pH closer to a neutral value and lessen the chance of unhealthy chemical reactions. Hydrolysis causes the breakdown of ATP, the molecule that forms when sugar metabolizes in the digestive tract and transfers to all cells. The introduction of water--two hydrogen atoms and one oxygen atom--to a molecule of ATP, or adenosine triphosphate, pulls one phosphate atom away from the molecule, forming adenosine diphosphate. The breaking of this bond releases energy that powers the body. Water forms the majority of the mucus lining that protects animal stomachs from the corrosive action of acid. Water passes directly into the intestine and the stomach without the need for digestion. It activates the sodium bicarbonate layer in the mucous membrane of the stomach, protecting it against hydrochloric acid. In addition, saliva, the fluid used to break down food in the mouth, consists mostly of water. In any animal skeleton, a protective layer of cartilage rests between bones to provide lubrication and prevent wear on the ends of the bone. Articular cartilage, the cartilage that exists in joints, consists of mostly water as well as a matrix of collagens and non-collagenous proteins. Without adequate water, cartilage wears down and restricts the range of motion in a joint. O., Michael. "Importance of Water in Animal Life." Sciencing, https://sciencing.com/importance-water-animal-life-6292820.html. 25 April 2018.